Joanne E. Mattiace Position: Law Firm Principal. Born Providence, Rhode Island. First admitted to the bar in Rhode Island in 1976, then admitted to the bar in Washington DC, 1978, District of Columbia. Education: University of Rhode Island (B.A. with highest distinction, 1973); Boston College (J.D., 1976). Legislative Counsel, 1977-1986, Sears Roebuck & Co. Bar Member: District of Columbia, International Consumer Product Health and Safety Organization. PRACTICE AREAS: Product Safety Regulation, Administrative Agency Practice; Product Recall; Corporate Law. Ms. Mattiace is a member of the International Sleep Products Association (ISPA), where she serves in a leadership position on the Better Sleep Council and on its Government Affairs Committee. In addition, ASTM’s Section 15 Committee, the National Association of Manufacturers’ Consumer Product Safety Commission Coalition and the Maine Manufacturers Association. Though Ms. Mattiace is now a Maine resident, she regularly divides her time between the beautiful Maine Seacoast and Washington, DC, where she remains active in a number of industry oriented groups. Ms. Mattiace is also a frequent lecturer, or workshop leader, in seminars and conferences dealing with product safety issues. Ms. Mattiace has been admitted to the bar of the District of Columbia. She has been admitted to the US Supreme Court and to various federal courts. In 1995 Ms. Mattiace was a contributing author to an exhaustive product safety book published by the American Bar Association, The Lawyer’s Guide to Elder Injury and Accident Compensation. That body of work was recently updated. She has also been a proud recipient of the Lawrence J. O’Connor Distinguished Legal Writing Award for her extensive writings regarding the issue of information disclosure by government agencies. Ms. Mattiace was additionally afforded the high privilege of serving as General Counsel to the prestigious Washington, DC organization, Women in Government Relations (WGR). She was later honored by WGR for her distinguished service to the group. 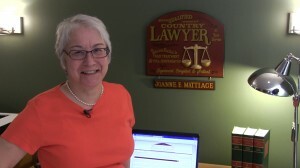 Ms. Mattiace is a proud member of the Windham, Maine Zoning Board of Appeals. Ms. Mattiace is associated with Legal Label, Inc. a company which provides assistance to companies with their varied label and registration needs.